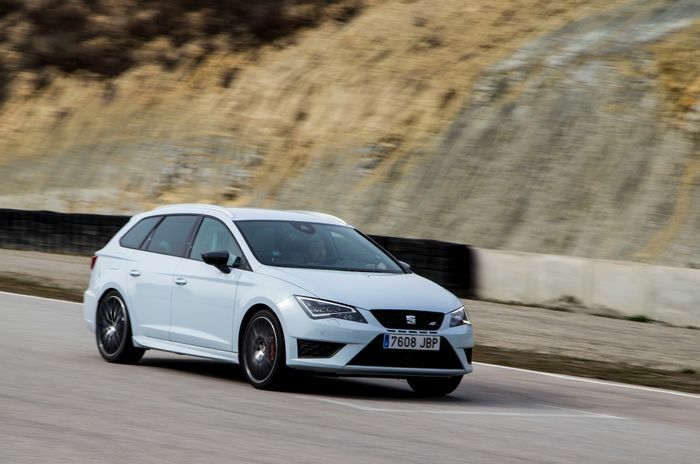 I spent a day thoroughly kicking the Leon ST Cupra’s head in at Castelloli circuit near Barcelona during the car’s international launch, and it lapped up every bit of abuse I clumsily threw at it with my cack-handed track driving. It has all the usual boxes ticked, like quick and accurate (if a little too light) steering plus very tidy body control, but the real hero of the hour is the electronically-controlled locking differential. Vorderachsquersperre, it’s called, or VAQ for short. It’s able to send up to 100 per cent of power to either of the driven wheels, and redefines what you might think is possible in a front-wheel drive car. It takes some time getting used to, as when it starts to wash wide, you really need to boot it, no matter how much your brain disagrees. And I mean really hoof it. Do so, and the front wheels drag the nose back into line, slingshotting you out of the corner while you feel a few mild tugs at the steering wheel. It can make the most oafish of drivers look like heroes. Oh, and forget torque steer, you won’t experience any discernable amount of that here. The extra 27cm and 45kg of boot dumped on the back aren’t awfully noticeable either, apart from the occasional squiggle from the rear under very heavy braking. It all feels very hatchback-like. Unlike the cars available to us on track - which unsurprisingly had their 19-inch wheels wrapped in super-sticky Michelin Pilot Sport Cup 2 boots (a £460 option) - the cars we used on the road routes made do with lesser Bridgestone Potenza rubber. But grip levels are still faintly ridiculous, and the ST Cupra’s just as entertaining on a back road as it is on a curvaceous circuit. 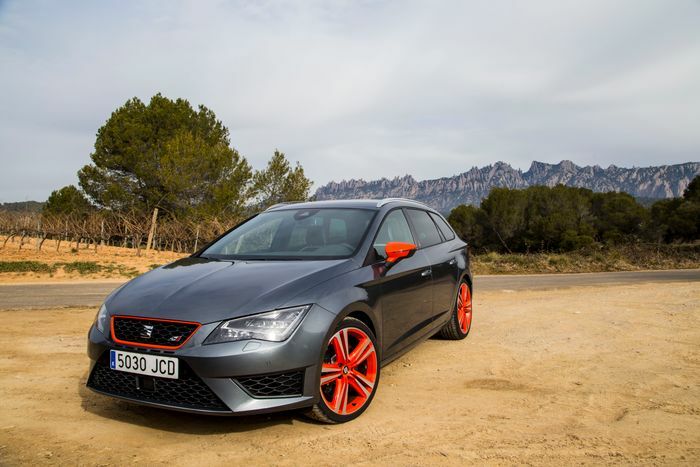 The Leon hatch is a decent looking thing, with sharp lines, good proportions and some tasty rear light clusters. It’s arguably much easier on the eye than the frumpy VW Golf and Skoda Octavia it shares its MQB chassis with, and the ST estate is just as pretty, if not prettier. As much as we love stupidly powerful stuff, the 276bhp and 258lb ft on offer from the Leon’s 2.0-litre turbocharged ‘EA888’ TSI lump strikes a good balance between being usefully quick but not license (and life) endangering. 0-62mph takes six seconds dead with the DSG dual-clutch gearbox (6.1 in the manual), 0.3sec down on the five-door hatchback. The engine has a pleasingly punchy mid range, and makes a suitably butch din. A little more volume in the hotter ‘Cupra’ driving mode would be nice, though. The DSG gearbox gives smooth and crisp changes while popping the occasional chuff out of the exhaust tips, but as good as the changes are - and despite the fact it’s the quicker car - we’d opt for a manual. The DSG’s brain is too much of a control freak even in manual mode, and the stick-shifter is cheaper (£28,505 vs £29,860). It’s a good ‘box’, too, with a short, precise shift. That longer tail of the ST gives a 55 per cent boost in boot space over the five-door hatch based on both having the seats down. 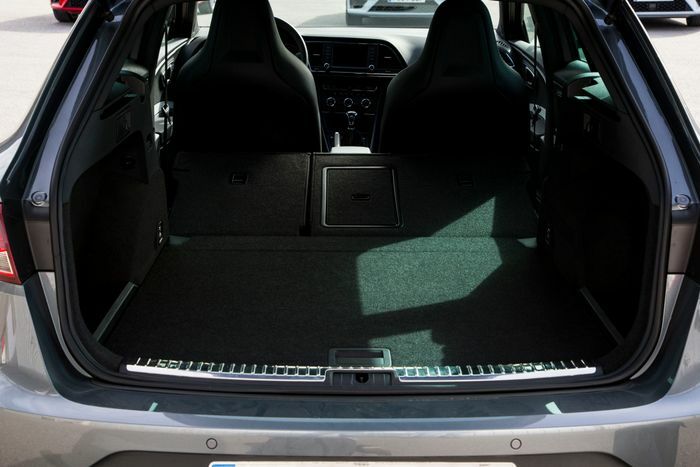 With the seats up, you get a decent 580 litres of space, more than the Ford Focus ST estate manages. The boot’s usefully designed too, with the floor sitting flush with the boot lip. No hauling luggage over an irrupting hump here. It’ll be good at the whole long-haul thing, too. The seats are comfortable and while it won’t fare as well on the UK’s god-awful broken-up road surfaces, the Leon is firm without having a ride that threatens to turn your spine to powder within a few hundred miles. The boisterous engine is also reasonably quiet when you’re not in an antisocial/spirited mood. It promises to be economical with a claimed combined 42mpg, and even while that’s the usual over-ambitious lab-obtained nonsense, we’ve found the Leon hatch to be economical in the past, considering the performance potential . 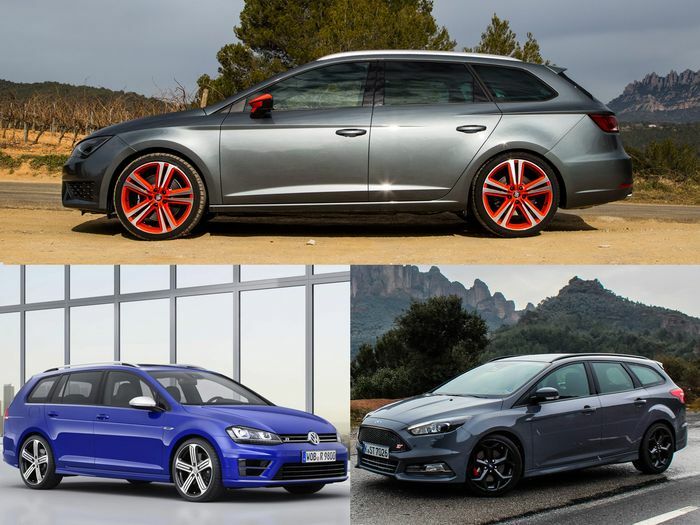 Unless you count the quirky left-field option that is the Subaru Levorg - when the damn thing finally gets to the UK - the closest thing the ST Cupra has to proper rivals is the Ford Focus ST estate and VAG’s own VW Golf R estate. The Golf will probably retail for around £33,000 when it goes on sale, won’t come with a manual gearbox option and - subjectively - it’s not as good looking. The Focus ST is sorely tempting and a lot cheaper - it’s £25,995 in ST-3 trim - and did impress us massively at the launch a few weeks ago. But, buy one of those and you don’t get the Seat’s trick diff. Or any sort of limited-slip diff goodness, for that matter. Which is something the 247bhp Ford could rather do with. Even when it comes to the other sub-£30k stuff we’ve looked at recently - the Subaru WRX STI and Ecoboost Ford Mustang for instance - few have an answer to the ST Cupra’s blend of practicality and bonkers cross-country pace. 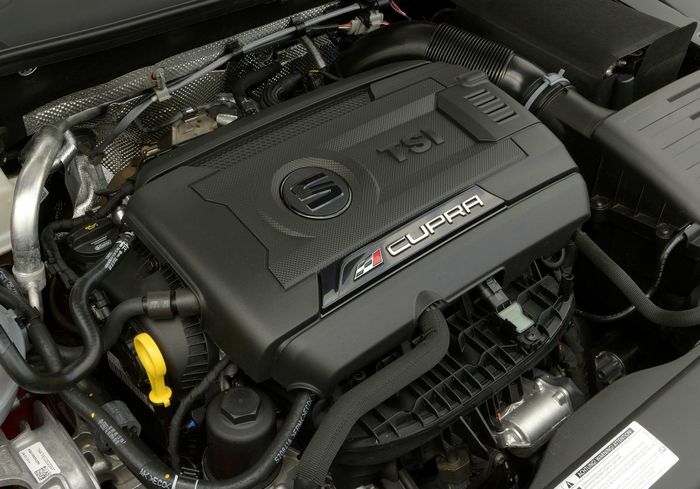 Every car has faults, and the Leon ST Cupra is no different. 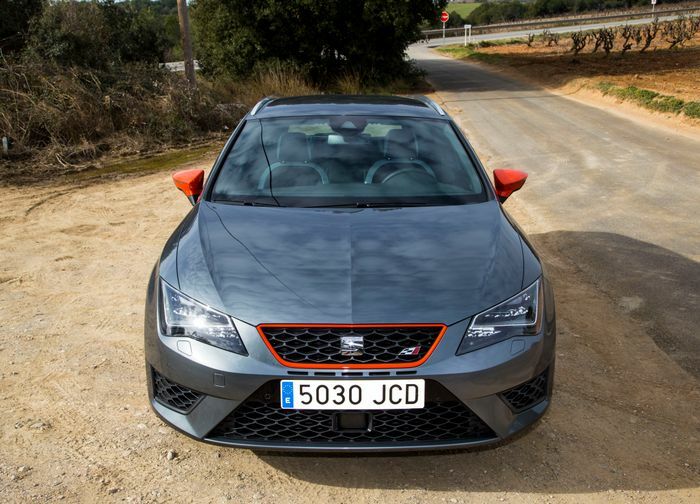 My main gripe is that the standard seats are woefully under-bolstered - as I found out during some bum-sliding laps around Castelloli - and the £1250 optional ‘Cupra’ bucket chairs are scarcely better. 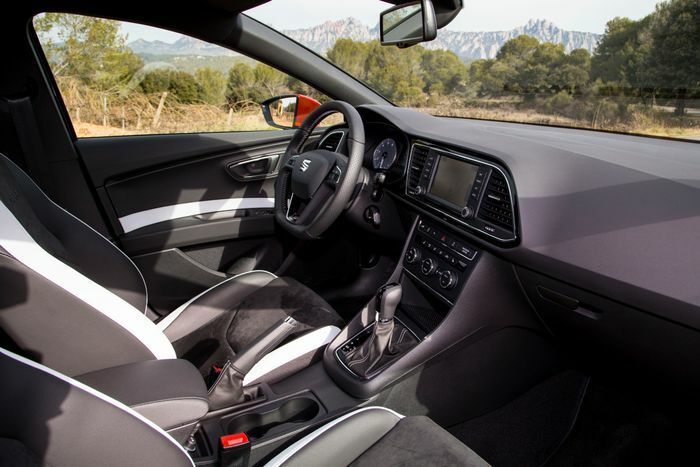 On the subject of the interior, the cabin’s a drab sea of grey, with few clues about the car’s performance. Is a little bit of flair too much to ask? The result of our two-day test in Spain is no great surprise. 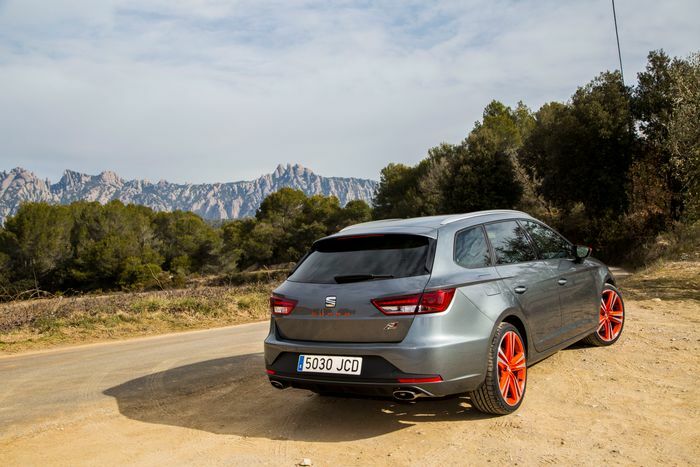 We were fans of the Leon Cupra hatchback when it launched last year, and sticking a jolly great boot on the rear hasn’t messed with the car’s winning formula. In fact, it’s added to its appeal. It’s still fast and brilliant to drive, but now, there’s space for all your clobber from Ikea too.